I am linking up with Kathleen at Growing Kinders to share our New Year's resolutions. Today we are talking about technology. I LOVE technology! The downside is how much time it takes to find the best technology, figure out how to use it effectively, and teaching the kids how to use it. raz-kids.com - This website allows me to input my kiddos and then assign them books to read at their level on the computer. They can have the book read to them, then they can read it themselves and then there are comprehension questions that they answer about what they have read. I can then get a report about which questions they answered correctly and which they got wrong. You can also have them read the book into a microphone and it will take a running record of them reading! You do have to purchase a subscription to the website but I LOVE it! Incorporate the iPads we have into math centers and use the iPads more deliberately. I have 3 iPads in my room and access to 10 more. So there really is no excuse for me not to be using them more. I do use the 3 that are in my room for literacy centers everyday. My kiddos also use them for free choice centers in the afternoon. They love to explore all of the apps! I just need to put the time in to find the best math apps we have loaded and then put them into my math center rotations. I guess I know what I will be doing when I get back to school. I'm off to add that to my To Do list! 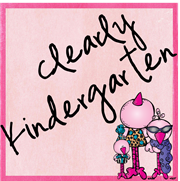 Be sure to go to Growing Kinders and check out all the great ideas and enter Kathleen's giveaways! I know I did!!! I wish I had wifi. I have two ipads but no wifi. Speaking of resolutions ... I FINALLY completed the Liebster Award that you nominated me for! YAY and THANKS! I am soooo jealous! I would love an iPad in my room :) I just had to stop by and say thank you for leaving such a sweet comment on my post! Your words brightened my day!